The heart of Plainfield holds one surprise (cool yarn shop!) after another (fantastic bike trail!). Bald eagles pass through the park, so stash a pair of binoculars in your hydration pack in case you’re lucky enough to catch a glimpse. In the spring of 2014, Charles Schindler gave up his dental practice to pursue his true passion: teaching mountain-biking. 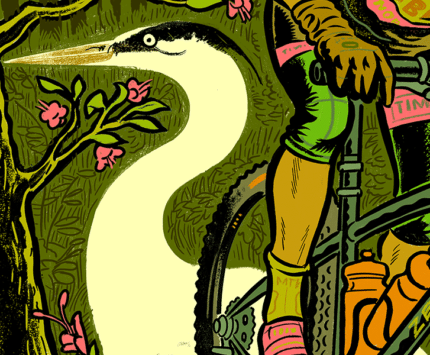 The geographic features revealed on the Indiana trails highlighted in this issue were surprising—from the prehistoric bog by the dunes to a sandstone canyon—making hiking and biking them all the more entertaining. Founded in 1957, the 580-member Indianapolis Hiking Club organizes more than 2,000 hikes annually around the state and beyond (including a 2015 weeklong trip to the Rio Grande). From Zionsville’s Starkey Park to Fort Ben, hike and bike your way around town.